To immerse oneself in the miracle of Daedelus’ music is to experience transformation through a seemingly infinite sense of discovery: Ideas lead to other ideas lead to other ideas leading to  where does it all end? And who will we be when we get there? Daedelus  whose name refers more to the mythical in-ventor-sculptor than Joyce’s troubled artist  is a young Southern California native (born Alfred Weisberg-Roberts). You could call him a DJ, sort of, though you’d more rightly think of him as a deviser of relevant modern art. Specifically, he is among an eensy-teensy handful of beats-&-samples types with something important to say about the potentialities and larger implications presented by the new digital technology (and, in his case, crap old synths, acoustic guitar or clarinet or double bass or celesta or dusty Marxophone or battered computer printer). “You can be like a sculptor,” says Daedelus. “You can layer and layer and layer, and reduce and reduce and reduce. The main thing for me is to start with limitations  that’s how you get the most out of it. Anything that helps limit the amount of possibilities, ’cause we’re living in a musical world that’s infinite, and it’s very daunting. The prolific Daedelus has released numerous solo albums for progressive/electronic labels (Phthalo, Mush, Plug Research, Laboratory Instinct), and collaborated with the redoubtable Dntel. He’s also responsible for what turned out to be arguably the most authentic hip-hop album of the last five years, The Weather, with speed-rappers Busdriver and Radioinactive. His latest, Exquisite Corpse (Mush/Ninja Tune), is a swirling steaming vessel of cinematic string splendor and dialogue snatches blended with mind-shatteringly elaborate though entirely slamming beats. He’s also recruited guest rhymers from the pick o’ the pack, including MF Doom, Sci, Cyne and Mike Ladd, as well as Prefuse 73 fella Scott Herren, who lends an editing/mixing hand. Not just another nosedive into the eternal, ever-morphing ocean of beats & samples, Exquisite Corpse (named after the Surrealist parlor game) is a work of weight that grows in impact and wisdom the more you open yourself to it. The arrangements and programming are things of extraordinary craft, matching tones with other tones as if they were paying each other compliments, saying things it’d take a zillion words to describe. Richly disparate in both source material and concept, the disc is a virtual handbook for aspiring DJs and “serious” composers alike. Be forewarned: Daedelus has a bigger record collection than God, covering not just your basics in hip-hop, jazz, and vintage funk/R&B/soul but many or most of the Hollywood and Euro film soundtracks circa 19401980; every kind of world music that ever was; healthy chunks of vintage electro-acoustic and musique concrète; and a lot of bossa nova, música popular brasileira and batucada. All this stuff, believe me, looks great on his shelves. And virtually all of it sounds incredible dissolved into his own music. Daedelus grew up in Santa Monica and attended USC, where he studied double bass, clarinet and jazz. For a brief period he went around telling people he was from Wales. But he was lying. That’s probably why he named one of his best albums, Of Snowdonia, after the national park in northern Wales. It’s an album of the most sweetly luxuriant orchestral samples liberally sprinkled with bells, then finely entangled, giving birth to charming lullabies and  zap!  rather rudely hyper drum & bass strangulations. 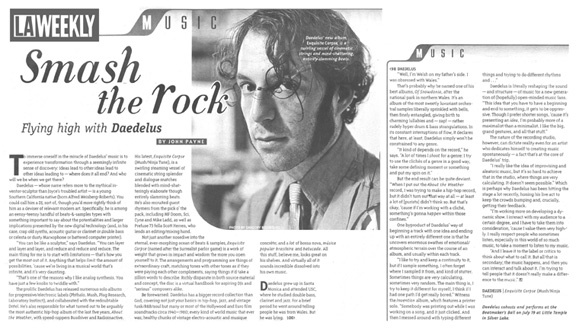 In its constant interruptions of flow, it declares that here, at least, Daedelus simply won’t be constrained to any genre. One byproduct of Daedelus’ way of beginning a track with one idea and ending up with an entirely different one is that he uncovers enormous swathes of emotional/atmospheric terrain over the course of an album, and usually within each track. The nature of the recording studio, however, can dictate reality even for an artist who dedicates himself to creating music spontaneously  a fact that’s at the core of Daedelus’ trip. “I really like the idea of improvising and aleatoric music, but it’s so hard to achieve that in the studio, where things are very calculating. It doesn’t seem possible.” Which is perhaps why Daedelus has been hitting the stage a lot recently, honing his live act to keep the crowds bumping and, crucially, getting their feedback. “I’m working more on developing a dynamic show. I interact with my audience to a certain degree, and I have to take them into consideration, ’cause I value them very high-ly. I really respect people who sometimes listen, especially in this world of so much music, to take a moment to listen to my music.